Tenzin Ösel Hita gave these Dharma talks during the 45th Kopan Course at Kopan Monastery, Nepal, November 27, and December 07, 2012. And I believe I still am today. I’m twenty-seven. It’s been already ten years and I’m still in the process of becoming a Buddhist. So it’s not something that just happens from one day to another Being Buddhist is not about just reading book or going to courses, taking meditation or initiations. It’s also about the lifestyle, the attitude you have, the way you think, the way you act, the way you talk. So that’s basically one of the important parts of being a Buddhist. 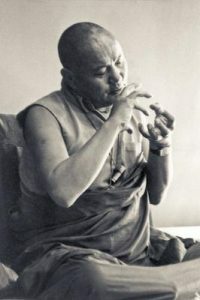 Venerable Geshe Tsulga (Tsultrim Choephel) was resident teacher at Kurukulla Center for Tibetan Buddhist Studies in Boston, MA. He passed away in November 2010. In this book, the highly learned and revered teacher Geshe Tsulga offers a concise explanation of how to put the Buddha's teachings into practice, with emphasis on the early stages of the path and guru devotion. Suitable for both beginners and advanced students. An excerpt of this book is included below. Click here to download the full English and Tibetan version of the book. When practicing Buddhadharma it should be practiced not just for this life but with thoughts of benefit in the next life onward. After all, working for the fleeting comforts of this life is not confined to humans. Even among animals there are many who do the same. The difference between humans and animals, therefore, should be determined by the ability to think long term. Therefore, the purpose of practicing Buddhadharma is to avoid the experience of, or to eliminate totally, the suffering that none of us wants and to gain the temporary and lasting happiness we all desire. Happiness and suffering arise from their own causes and conditions. They do not appear without prior causes and conditions, nor are they produced by a creator of the world. Therefore, one should first know or identify the causes of suffering and happiness. Then, because suffering is an unwanted phenomenon, the causes and conditions of suffering should be destroyed. Suffering is a result created from causes and if the causes and conditions to create that result are not there, suffering cannot arise. For example, if the seed of a flower is missing, no flower can grow. Likewise, if we wish to have happiness, we should learn the causes of happiness through an investigation that searches for the causes and conditions that produce happiness. Then, we should work to gather these causes of happiness with great determination. If the creation of these causes and conditions is complete, it is not possible for the fruit of happiness not to arise. For example, if rice seeds, water, fertilizer, and so forth are present in the fields during spring, a good harvest will follow in autumn. If they are not present, no harvest is possible. Practice should consist of methods to eliminate nonvirtuous activity and mental afflictions, the very causes of suffering, and to bring the causes of happiness—faith, wisdom and their associated practices—into one’s being. These two kinds of practice is what is meant by the practice of Dharma. Moreover, the term "Dharma" means to hold or to protect. If one practices Dharma well, one will be held back from falling into the depths of the lower realms or from the fear of being reborn in such places and will be protected from such suffering. Furthermore, Dharma in this context of "practice" should be understood as being a method to remake the practitioner's way of thinking, or to transform his or her mind. we run toward the causes of suffering. as if it were our enemy. is the cause of unwanted suffering. Seeing this, we hold it in contempt and as worthy of blame. Bless us to destroy the demon of selfishness. Self cherishing is the road to every trouble. Thinking of our ourselves is the doctrine of the devil. We should look upon this self-cherishing attitude as our principal enemy who has dealt ourselves and others so much suffering since time without beginning. Therefore, by turning away from this unbefitting and ingrained attitude we should develop the mind that thinks about happiness for ourselves and others from the next life onward as well as an attitude that works toward that end. By training in Buddhadharma it is possible to change our minds to such a way of thinking. If we train ourselves through the proper practice of Dharma, working for the benefit of future lives and not for this life alone, with the thought of working for others and not for ourselves alone, then our minds can be led into that direction. Therefore, Dharma has been spoken of as that which holds us from the abyss, protects us from fear, tames the mind, remakes the mind, and transforms the mind, and it should be understood in this way. A rebirth complete in leisure and endowment is very difficult to gain. Even attained it is so difficult to find once more. Strive in practice, therefore, and make it meaningful. do not render it meaningless. As this quote explains, we have gained this precious form with its leisure and endowments, met with the precious teachings of the Buddha, and met with the teacher or guru who flawlessly shows us the path. These and every other favorable internal and external condition for the practice of Dharma have come together at this one time. Now we must give this achievement of a human rebirth meaning and power. If that were not possible, we would have to conclude that there is no difference between being born as a human and being born as a dog. will not produce birth in higher realms. Within us nonvirtuous activity is stronger than virtuous, and the mind, therefore, is held or bound by mental afflictions. This means that even neutral states of mind, not to mention virtuous, do not arise that often. This is because our minds naturally gravitate toward nonvirtue. Such activities, in terms of their fields, motivating thoughts, bases, and objects, have great strength and it will be difficult to purify ourselves of them totally before we die by means of confession and strong resolution. even the words "happier realms"
there is danger that the death of today will arrive. if you want to practice Dharma, do it today. 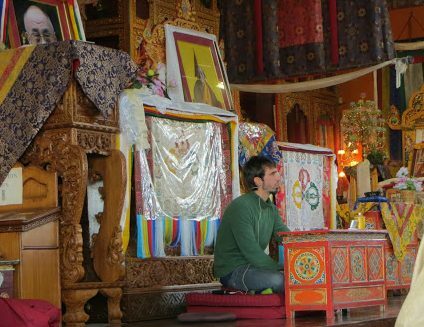 A talk by His Eminence Kalu Rinpoche about the four Tibetan traditions. From a talk given by His Eminence Kalu Rinpoche in Darjeeling, India. Translated by Harold Richards. The Buddha said that many hundreds of Dharma traditions would come into this world. All traditions would arise from the perfect action of awakened buddhas and would be their means of helping sentient beings. What would these means be like? Entrusting ourselves to some religious traditions would enable us to take birth in the elevated planes of those religions: as human beings or as desire realm celestial beings. Through entrusting ourselves to others, we could be born into the seventeen planes of the form realm or in the four states of the formless realm. Moreover, they reveal ways of blocking the access to ill-gone states (as animals, etc.) and gaining elevated planes of existence. All give us strength and transforming powers. Some practices are meant to give us the capability of attaining Lesser Vehicle levels of the Enemy Conqueror and the Solitary Realizer (Hinayana arhat and pratyekabuddha) and others give the ability to reach the Greater Vehicle (bodhisattva and Buddha). They do this, and so I believe in all religious traditions. All derive from the perfect actions of the Buddha and give sentient beings release from cyclic existence in both temporary and ultimate senses. Accordingly, these are the subjects I teach my disciples. While I was in Tibet there were eight major Buddhist traditions, but nowadays in India, the Land of Superiors, only four have been able to flourish. These are Sakya, Gelug, Nyingma and Kagyü. Again, each conveys the stainless word of the Buddha above all and has produced successions of expert scholars and realized saints (pandit and siddhalabdha) to further it. Thus each is like pure gold, authentic Dharma untainted by anything vile, a thing most people don’t find even when they search, something that can lead to liberation from cyclic existence and to omniscience. This is Dharma in all its profundity and vastness. If they are all the Dharma of the Buddha, why are there all these different systems? Generally speaking, the variety is produced according to the inclinations of different people. Each particular system is distinctly for the aptitudes of particular people whose minds are ready to be cultivated by such a system. All four major traditions have in common the four ways of converting frames of thought, going for refuge, generating the two precious gems of relative and absolute enlightenment mentalities, and evolution and perfection phases. It is not for anyone to call one good and others bad. All are only good. Nonetheless, each individual tradition has its own records of profound gracious advice from the personal experience (gDams ngag) of particular gurus and from the oral tradition techniques for efficiency (man-ngag) transferred from one vessel (i.e. disciple) to another. It is while someone is involved in the practice of his religious system that he is given detailed essential pith instructions by the noblest lamas. It seems to me that each tradition must benefit someone who has the inclination and prior associations and so I have no partiality to any of the Dharma traditions. Call them systems of gracious advice or Dharma; all are what I teach. 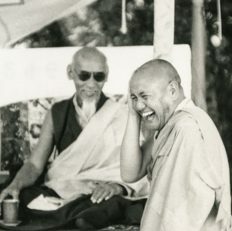 In addition, all traditions stress good practice of the principle of cause and effect and in this every one of them maintains above all the four ways of converting of thought—the turning about in our patterns of thought regarding this cyclic existence—as the means of a basis for being able to aim for liberation and buddhahood. 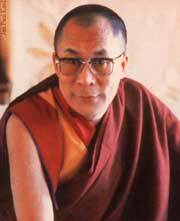 As for a general account of my lamas: in Tibet the lord of all doctrine is His Holiness the Dalai Lama. Everyone knows that. 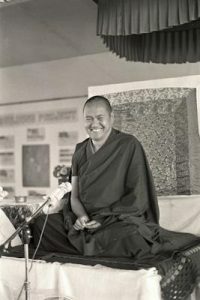 As such, out of his great compassion he puts into operation the means for all presentations of doctrine without distinction enabling them to flourish more and more and for helping particular sentient beings and migrating beings in general. Consequently, he is also an exceptional lord of exposition in each doctrine. At present the lord of Kagyü doctrine is His Holiness Karmapa, whose name is well renowned, the lord of Nyingma doctrine is Kyabje Dudjom Rinpoche, and the lord of Sakya doctrine is Sakya Dagchen Rinpoche. While acting as the heads of doctrine, these four provide (spiritual needs) with great kindness and, due to this, in places like India, Nepal, Bhutan, and Sikkim, the Buddha’s teachings are flourishing and radiating like a shining sun. As far as I’m concerned, I have been fortunate enough to gain many empowerments, transmissions and discourses from His Holiness the Dalai Lama and his two tutors, Kyabje Ling Rinpoche and Kyabje Trijang Rinpoche. I have also received many from my root guru, His Holiness Karmapa and from both Kyabje Dudjom Rinpoche and Sakya Trizin Rinpoche. 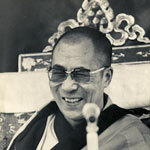 By entrusting myself to many lamas of all four traditions I am creating good associations and a great sense of belief. Furthermore, within my group of disciples, there are many monks and lamas of the four traditions and I feel that I serve their doctrine without discrimination in tenets. However, I must be really fortunate to have Sakyapas, Nyingmapas, Kagyüpas, and Gelugpas all in my monastery. Subsequently, through bearing all tenets of the religious traditions as my crown, and revering them, I hope to be a practitioner of them all and similarly intend the recipients of my teaching to have great belief in all doctrine. When someone has an association with some system of Dharma and a lama, it is permissible that he mainly practices that particular doctrine. Such tendencies are the result of the force of his individual activities in prior lifetimes. Apart from this, I feel that to be a believer without distinction in all tenets is authentic evidence of a noble being. It is an outcome of having accomplishments of expertise, sincerity and goodness, that the lamas, abbots, masters and tulkus can explain, debate and compose, bringing about the welfare of sentient beings; and all have great belief without distinction. So it is that the teachings of Buddha are spreading through the West for the first time. In this pioneering context you might think yourself a practitioner merely through having heard some scanty pieces of Dharma. On the other hand, not remaining content with a limited understanding of the Dharma, you might make a proper study of it and from the outset with the motivation of benefiting sentient beings, you could put into practice all of the teachings about the opportunities so hard to achieve (precious human body), death and impermanence, cause and result and the faults of cyclic existence, followed by the ten grounds and five paths up to the ultimate: buddhahood. Thus, to whichever lama you might entrust yourself—Sakyapa, Gelugpa or Nyingmapa—if with belief you combine your mind with the aim for perfection of the practices by every means, then doing them will be worthwhile. Otherwise, by pursuing diverse aspects of Dharma in meager ways, learning a few phrases here and there, and acting out the semblance of being a practitioner, it will be difficult to derive much benefit. Is it not better to practice perfection without cheating yourself? 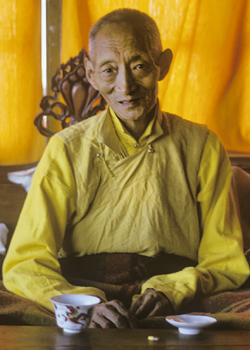 This talk was given by HH Zong Rinpoche in Kathmandu, Nepal April 1974 at Kopan Monastery. 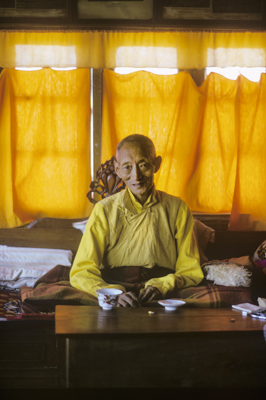 His Holiness Zong Rinpoche came to stay at Kopan Monastery for a few days during the Sixth Meditation Course, March-April 1974. He gave this talk to almost two hundred Western students on April 17. It was translated by Lama Thubten Yeshe and edited by Nicholas Ribush. Read the transcript of Lama Zopa Rinpoche's teachings from the Sixth Kopan Course on the LYWA website. 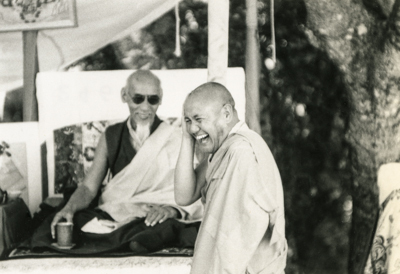 Lama Yeshe and His Holiness Zong Rinpoche at Vajrapani Institute, California, 1974. Photo from the collection of Francesco Prevosti. Photographer unknown. Rinpoche says that he’s just given you the rlung, or oral transmission, of the Avalokiteshvara mantra, and that there’s a Dharma relationship between all of us from the past; we’ve all known each other before. Rinpoche says that he’s much attached to Dharma wisdom because he’s been practicing it since he was six or seven years old, and he’s very happy that all of you are acting in accordance with it. However, you should make sure that you’re sincere in trying to understand the Dharma and not just on some trip. His Holiness the Dalai Lama says that he’s seen some people study Buddhism quite deeply but then not put what they have learned into action so that after some time they disappear without an atom of wisdom. He says he has known Lama Zopa Rinpoche for a long time and although Rinpoche has not had that much time to study, he has something, he knows something that is as valuable as scholarship. He sees what Rinpoche’s doing for you people and thinks it’s beneficial, especially since you have come from so far away, seeking Dharma knowledge-wisdom. It’s difficult but of course, your searching for the Dharma means you have a tremendous level of morality within you, and therefore he’s very glad. But of course, in general, whenever anybody practices Dharma it’s very good. In particular, those who have renounced samsara in order to put all their energy into the Dharma path are very fortunate to have come to that decision. That’s most worthwhile. And those of you who have taken ordination as monks and nuns—which has been your own decision; nobody else has made you do it—please try to put all your energy into the Dharma path of liberation according to your decision and become continuously successful. That’s really worthwhile. Lord Buddha himself said that this decision of wanting to take ordination and then keeping your body, speech and mind pure, not harming any other sentient being, is much more beneficial these days than it was in Lord Buddha’s time. In fact, keeping the ordination for one day of this twentieth century is much more beneficial than keeping it for a whole lifetime back then. Now, you hear many teachings at this meditation course but the main, fundamental thing you need to know is how to take refuge, what the essence of refuge is, what karma is and how it’s created. Those are the main things you need to know. You can’t spend your life sitting in the lotus position meditating. So taking refuge in Buddha, Dharma and Sangha, actualizing your practice continuously and following karma strictly are important. I’m sure Lama Zopa Rinpoche has explained all this and I’m sure you know it too. The root of what we call Dharma is the mind, your mental attitude, therefore, even if you create negative karma you can purify it; we have the methods for doing that. And also, you should always have pure thoughts and generate a pure motivation, whatever Dharma practices you do. That, too, is important. We’re always so busy that we don’t have time to meditate every day, but each night, before you go to sleep, you should take refuge, reflect on the excellent qualities of Buddha, Dharma and Sangha, and try to sleep with a pure, positive motivation. In that way your sleep itself becomes Dharma practice and your positive energy automatically increases. Then, when you get up in the morning, instead of thinking about samsaric things, again think about the good qualities of Buddha, Dharma and Sangha. So in the morning, get up, make three prostrations, take refuge in Buddha, Dharma and Sangha and generate a pure motivation for whatever you’re going to do that day. This is very important and worthwhile since you can’t practice perfect single-pointed concentration because of your busy life. If you do this continuously every morning it will be very effective in helping you integrate every day of your life with Dharma knowledge-wisdom. Of course, life is difficult—it’s hard not to create any negative actions—but there’s a solution. You can purify them with understanding knowledge-wisdom. So instead of being discouraged, thinking, “Oh, I can’t do anything; I’m so negative,” know that knowledge-wisdom is a powerful antidote to negativity and stop feeling sorry for yourself and hanging onto your old habits and uncontrolled energy. So make a strong effort to purify your negativities with wisdom. I know it’s hard for you to practice only Dharma and not engage in any samsaric activity, but try as much as you can to do some of the things we’re doing here, such as prayers, mantras and so forth. Do your best to bring Dharma wisdom into whatever situation you’re in and, slowly, slowly, you’ll continuously develop. Then, even if you don’t reach levels of perfection in this life, there’s hope that you might do so in the next. It’s possible. Another thing is that rather than hating people who practice Dharma you should be glad and rejoice in their actions. Sometimes your friend might do something good, some meditation or something, and you look at him sideways, “Hmm….” Instead of being jealous, be happy. That, too, is very important. It becomes wisdom. Remember how Lord Buddha spent years actualizing knowledge-wisdom while he was on the path to enlightenment and finally gained perfect liberation, and be happy; rejoice instead of feeling hatred. Doing so creates the cause for you to also reach that level. Similarly, when you see people reciting mantras, doing prostrations—there are many different ways of actualizing Dharma knowledge-wisdom—instead of looking at them funny, “What’s she doing, why is she trying to be different?” try to feel glad. Or when you see somebody who has taken ordination trying to keep his or her body, speech and mind pure, instead of feeling dislike and jealousy, rejoice that the person is trying to do something positive. When you rejoice at others’ positive actions you also create merit. That’s better than looking critically at what others do and putting them down, thinking they’re just trying to be different. When you rejoice at others’ positive actions you generate positive energy within yourself. And not only at others’ positive actions—you can also rejoice at your own positive actions. Be happy that you have found the chance to gain Dharma wisdom, which is very difficult to find. It’s not easy to have the opportunity to open your mind, develop awareness and discover the true nature of your internal world. This truly is most difficult. You can see this for yourself. Look at the members of your own family and the people in your own country and abroad. It’s extremely difficult to come to the conclusion that it’s important to search for the inner truth and develop knowledge-wisdom. So feel that you are very, very fortunate to have come to that conclusion yourself—when you do, that itself increases the energy of your Dharma wisdom. During the meditation course you might sometimes feel that developing Dharma wisdom is difficult but try not to think that way and feel fortunate instead. Of course, when you practice Dharma problems might arise but instead of thinking, “This is a problem, this is bringing me down,” try to make it a positive experience. Transforming negative experiences into Dharma wisdom is very important. We think, “I’m suffering, I’m agitated,” but if you really look at this agitated life you’ll see how short it is. When actualizing Dharma wisdom on the path to liberation it’s natural for samsaric problems to arise; you have to expect them. But this life itself is short, transitory and illusory and you should not be attached to samsaric happiness, which lasts just a day or two. There’s no point clinging to that and it really doesn’t matter whether you’re samsarically happy or sad; it doesn’t matter. Rather than being up and down all the time, you’re better off continuously actualizing Dharma wisdom. When everything’s going well you say, “Oh, I like practicing Dharma,” but when you encounter problems you say, “It’s too hard.” Some little problem arises, perhaps with a friend, you’re up and down, and for that small reason your practice suffers. You shouldn’t let small samsaric agitation upset you; your wisdom should be stronger than that and you should not so easily lose energy and give up your practice. That’s wrong. Rinpoche says that he has had contact with us before and we have met this time in order to develop Dharma wisdom, not simply for this life’s happiness. Similarly, you’re taking this meditation course because of your tremendous past connections with Lama Zopa Rinpoche; there’s a strong karmic link between his energy and yours and you’re extremely fortunate to have that contact. It hasn’t happened accidentally or because of something that happened just last year. He also says that he’s glad that you can see the possibility of actualizing the path to everlasting peaceful liberation and is happy to be able to talk to you for this short time. He feels he doesn’t have to explain too much because Lama Zopa Rinpoche is doing that and there’s much you know already. So, please actualize what you know and feel is worthwhile, and he will pray for you to continuously actualize knowledge-wisdom on the path to liberation. Thank you so much.